For the beer of the same name, see Cuauhtémoc Moctezuma Brewery. Tecate (Spanish (help·info)) is a city in Baja California, Mexico, and the municipal seat of Tecate Municipality. 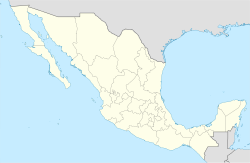 It is on the border with Tecate, California, United States and is part of the San Diego–Tijuana metropolitan area. There is a small port of entry between the sister cities that serves as an alternative to the bustling ports of entry in Tijuana. As of 2015, the city of Tecate had a population of 72,860 inhabitants, while the metropolitan area has a population of 102,406 inhabitants. The city sits at an elevation of 1,770 feet (540 m) above sea level. Tecate was founded on October 12, 1892. It is in a valley and is surrounded by several hills and mountains, the most prominent and famous of them being Kuuchamaa (also spelled Kuchamaa and Cuchama) Mountain. Kuuchamaa Mountain, also known as Tecate Peak in the United States, is a sacred mountain for the Kumeyaay people (known in Mexico as Kumiai) people, and the Kumeyaay language is still spoken in the mountains near Tecate at Juntas de Nejí. Kuuchamaa is rich in greenery, wildflowers and birds. Tecatenses as well as tourists are often seen enjoying hikes and bike rides along its many trails. In 1829, the Mexican governor of Alta California José María de Echeandía granted the valley of Tecate as the 4,439 acres (1,796 ha) Rancho Tecate to Juan Bandini. In 1836 the mountain dwelling Kumeyaay with some aid from some former mission neophytes, raided and plundered the rancho. They besieged the ranch house but the men within managed to hold out until it was relieved by a force from San Diego. With his stock and horses stolen and the house burned, Bandini—like owners of other ranchos near San Diego—had to abandon the isolated rancho. Due to the continuing hostilities with the Kumeyaay, Bandini never returned, being compensated with Rancho Jurupa, in 1838. In the late 19th century farmers and ranchers arrived in Tecate for the first time since Bandini's failed attempt to settle there. Soon after, they discovered its plentiful natural resources and decided to settle. Its abundant water and fertile soil made Tecate the perfect site for a productive farm market. Olives, grapes and grain became Tecate’s staple crops. The industrial sector was developed simultaneously with the creation of coffee processing plants and breweries. Well known for its traditional infrastructure and looks, Tecate remains true to its origins with its main plaza in the center of the city and its city hall and historic church within walking distance. Tecate's altitude of approximately 1,770 feet (540 m) above sea level and its proximity to the ocean contribute to the temperate climate. It rains enough in the area (almost 14 inches/352 mm per year) for a thick ground cover of shrubs and scattered trees to grow. The gradual transition from coastal to desert climate is on the eastern side of the peninsular mountains a few miles east. Although often boulder-strewn, much of the land to the east of the city is taken up with ejidos, or cooperative farms. Tecate is also the name of a small river that courses through the city, and of a hamlet on the Alta California (US side) of the border, affectionately known as "Tecatito" (population around 100; ZIP code 91980). Tecate is hot and dry during the summer and cold and sometimes rainy during the winter. It is classified as a hot-summer mediterranean climate. Tecate, which reported a population of 72,860 in the 2015 census, serves as the administrative centre for the Tecate Municipality. Tecate is the site of the first brewery of Tecate Beer. Industrial companies from across the border have their manufacturing affiliates there (e.g., Rockwell Automation, Ingersoll-Rand, Milwaukee Electronics, Automation Controls Group and Oberg Industries). The city is served by a couple of hospitals and several clinics, as well as a couple dozen doctors and dentists. Tecate is on a spur of Mexican Federal Highway 2 that connects Tijuana with Mexicali via the central Sierra mountains. It is on the older, two-lane, east-west road which is toll-free. A train from Campo, California, called the Tecate Ticket, travels to Tecate on a monthly basis (currently suspended due to a tunnel fire along the route). The train is run by the Pacific Southwest Railway Museum. The city is the location of the Tecate Airport, at Maclovio Herrera, which no longer operates due to low traffic. Instead, Tecate residents are served by nearby Tijuana International Airport (TIJ), with flights to most major Mexican cities. TIJ is closer to Tecate than Mexicali International Airport and thus used more frequently by Tecate residents. In May, the annual Tecate-to-Ensenada bicycle race takes place, with thousands of cyclists from both sides of the border participating. July is the time for a two-week celebration in Los Encinos Park, featuring dance groups, crafts, food concessions, and exhibits. The pamplonada, or running of the bulls, was ordinarily held in August in the 1980s and early 1990s along one of the main streets, but it was canceled because of a series of accidents and violence. Tecate has a stadium, Manuel Ceceña, which is home to the local baseball team, the Cerveceros ("Brewers"). Tecate is the site of the Autonomous University of Baja California, Tecate. The school houses a school of engineering. Tecate has a competition every year for 5th grade students where they share their ideas to change their community in a positive way. The best one competes against the best ones of each city of the state. The winner competes against the other states, and the winner meets the President of Mexico. ^ a b c d "División municipal. Baja California". www.cuentame.inegi.org.mx. Retrieved 13 April 2018. ^ "Mexican Area codes and Baja California Area Codes - Baja Real Estate Group". www.bajarealestategroup.net. Retrieved 13 April 2018. ^ SHIPEK, FLORENCE C. (13 April 1985). "KUUCHAMAA: The Kumeyaay Sacred Mountain". Journal of California and Great Basin Anthropology. 7 (1): 67–74. JSTOR 27825214. ^ Hinton, Leanne. "Kumeyaay 1-10. Hablamos Tipay en el dialecto de Nejí (Xa'a Wa) BCN". Language Acquisition Resource Center, San Diego State. Retrieved 2014-06-21. ^ William H. Ellison (13 April 2018). "The Life And Adventures In California Of Don Agustin Janssens 1834 1856". The Huntington Library. Retrieved 13 April 2018 – via Internet Archive. ^ "Tecate Baja California Mexico a charming village". www.baja-web.com. Retrieved 13 April 2018. ^ "Estado de Baja California-Estacion: La Puerta". Normales Climatologicas 1951–2010 (in Spanish). Servicio Meteorologico Nacional. Archived from the original on 3 March 2016. Retrieved 8 May 2015. ^ "Extreme Temperatures and Precipitation for La Puerta 1946–2011" (in Spanish). Servicio Meteorológico Nacional. Archived from the original on 3 March 2016. Retrieved 8 May 2015. ^ "Hospitales Sanatorios Y Clinicas en Baja California, Tecate". Seccion Amarilla. Retrieved 13 April 2018. ^ a b "Medicos en Baja California, Tecate". Seccion Amarilla. Retrieved 13 April 2018. ^ "70 Must Do's Discover Baja California". Baja California Secretaria de Turismo. Retrieved 6 March 2012. Wikivoyage has a travel guide for Tecate. Wikimedia Commons has media related to Tecate.